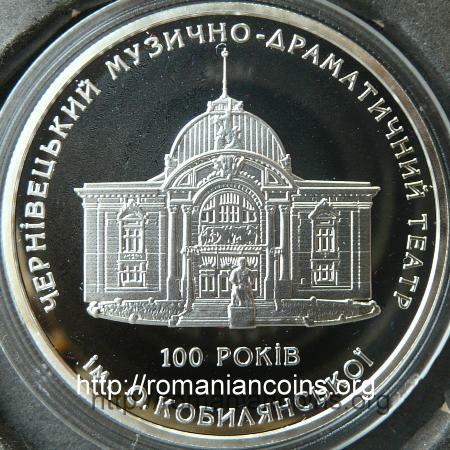 This coin was issued by the National Bank of Ukraine for the celebration of 100 years from the inauguration of the Drama Theater in Cernăuţi. 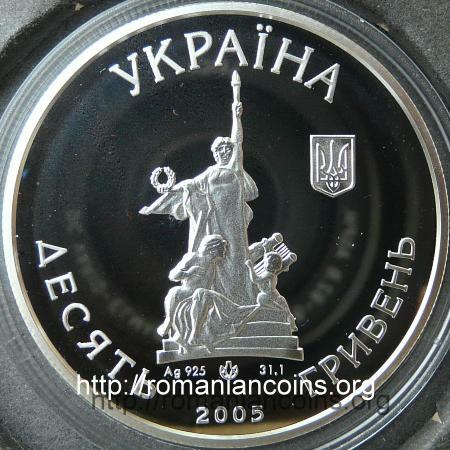 This coin appears on Romanian coins because the city of Cernăuţi belonged for many hundreds of years to the medieval Moldavian state and because the town was one of the greatest Romanian cultural centers. 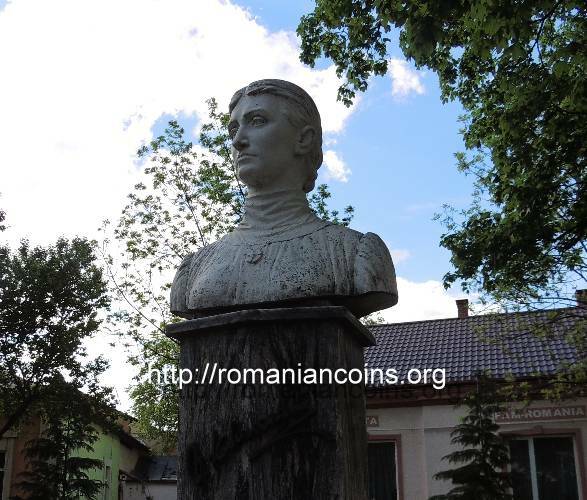 The town of Cernăuţi is linked to the name of the greatest Romanian poet Mihai Eminescu: the poet lived and learned here for several years. In front of the name of the theatre is "im", an abbreviation for the word "imeni". The use of this abbreviation (typical for Russian and Ukrainian) inside the formula "TEATR im. O. KOBYLIANSKOI", meaning "O. Kobylianska Theatre", can be translated - verbatim - as "the theater bearing the name of Olga Kobylianska". The building of the theater in Cernăuţi was erected in 1904-1905. It was designed by the Fellner & Helmer architecture studio in Vienna. The architects Ferdinand Fellner junior (1847-1916) and Hermann Gottlieb Helmer (1849-1919) were specialized in designing theaters and concert halls. The National Theater in Iaşi, Romania, was also built by them. At its beginning the theater was named City Theater, and in front of it the statue of German writer Friedrich Schiller (1759–1805) was placed. The square in front of the bulding was named Elisabeth-Platz (Elisabeth Square). During the First World War, Bucovina was the scene of some bitter fightings, the area having passed from Austrians to Russians and back for several times. Consequently, the theater was closed. After the union of Bucovina with the country the plays were resumed. In 1922 the theater became a Romanian national theater, and the square was named Vasile Alecsandri Square. After the Soviet ultimatum in 1940 the northern part of Bucovina was occupied by the Soviet Union, and was given to the Ukrainian Soviet Socialist Republic (the land taken from Bucovina represents a large part of the territory of the nowadays Cernăuţi region). Eliberated and reunited with Romania in 1941, the region was conquered again by the Soviets in 1944. The theater was renamed "Olga Kobylianska Theater", and Vasile Alecsandri Square became Theater Square. The writer Olga Kobylianska (1863-1942) was born at Gura Humorului. Her father was an allogeneous administration worker, of Ukrainian ethnicity, born in Galicia. Her mother was also allogeneous, descent of a German family immigrated into Bucovina (Werner). In the 80's the square received the statue of the writer, also represented on the coin. A bust of her was unveiled at Gura Humorului in 2003.